As the consumer opens the can, a straw appears as if, Ball says, ‘conjured out of thin air’. Decorable by laser technology, the straw offers additional space for brand presentation in the form of logos or promotional codes. Ball will be presenting more novelties at drinktec, for example, the Aluminum Bottle, which it’s now able to offer customers in a long-neck version. These long-neck bottles with a crown cork are available in sizes from 330 ml to 47.3 ml (11-16-oz.) and can be designed in eight colours, including gold and silver. That makes them ideal for classy events and premium locations, conveying just the right image for high-quality brands. Ball is also showcasing the practical Alumi-Tek bottle. Thanks to its re-sealable twist cap, the Alumi-Tek bottle is ideal for enjoying drinks while out and about. These aluminium bottles are both ideal for printing and can be completely recycled after use. “Beverage cans are particularly attractive to the young, active and mobile consumer. These consumer groups like to know that they can enjoy their drink ‘on the go’ – whether in sport, at a concert or in other leisure activities. The unbreakable can is particularly suitable for such occasions, giving effective protection from light and air in equal measure not only for beer, soft and energy drinks,” adds Hirszowski. 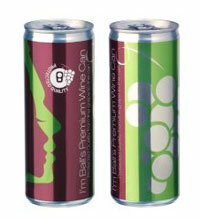 Another exhibit will be Ball’s Wine Can (left) with its ‘Protected Quality’ seal that offers young wine drinkers an optimum mix of convenience, small portion sizes and high-quality drinking enjoyment. Ball will also be showing how, with Augmented Reality applications or Quick Response (QR) codes, interactive promotion concepts can be created to enhance brand loyalty among consumers in a fun and engaging way. According to the study “Global Interactive Packaging Market 2012-2013” of the British market research organization Visiongain, it is a segment that is growing particularly quickly. And there’s more … Ball will also be exhibiting its variable printing technology, Dynamark, for individualised consumer targeting. It enables up to 24 design variants to be applied per production run – even in the case of large batch sizes. “From logos and portraits to graphics and individualised messages, all things are possible, providing for direct consumer communication and eye-catching allure at the point of sale,” says Hirszowski.